ANC is an important medical term in cancer: Absolute neutrophil count (ANC) is a measure of the number of neutrophils, a type of white blood cell that fights against infection. A normal ANC is above 1,500 cells per microliter. An ANC less than 500 cells/µL is defined as neutropenia and significantly increases the risk of infection. The bone marrow is where all white blood cells are produced. Looking back in time I am absolutely amazed at Ashtyn’s circumstances prior to being hospitalized. A few weeks before getting admitted to the hospital, Ashtyn did feel sick. Mostly she was just tired. Very tired. But she tried to go about her normal activities. Though she missed over a week of school, she continued going to church on Sundays, piano on Mondays, youth group on Tuesdays, and family parties. On January 19th, 1 ½ weeks before diagnosis, she felt awful but insisted on me taking her to the L.D.S Draper temple with Chandler to do baptisms for the dead. The day before going to the hospital she went to the humanitarian center with her youth group. Ashtyn also attended school the day she went to the hospital and had plans to clean a neighbor’s house the following day. She had the strength within to push through extreme fatigue to accomplish the things she wanted. Why is this so remarkable? Several reasons. The day she went to the hospital Ashtyn’s ANC was 200. Two Hundred!!!!!! Cancer patients aren’t allowed to leave their room without a mask with an ANC that low. They aren’t allowed home until their ANC is at least 500 because of the likelihood of infection, and even then they aren’t allowed to go to school or church for fear of exposure to illness. Ashtyn came to the hospital with an extremely low white blood cell count but wasn’t sick with any “normal” illness. I have no doubt it was a complete miracle that she didn’t come in with pneumonia, the flu, or some life-threatening illness from public exposure. Her entire school was riddled with illness. Morgan was even home sick with a severe sore throat. What a blessing it was to be able to come into the hospital and be able to tackle the diagnosis of leukemia without the complications of having to battle a difficult infection. When Ashtyn was admitted to Primary Children’s they immediately put her on the immunocompromised floor to protect her from infection. She was also given 2 units of red blood cells because her hematocrit was so low. How was she functioning at home with such low white and red blood cells? And how on earth was she not sick with an additional illness? Total Miracle. 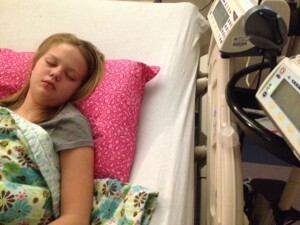 Ashtyn has been on chemotherapy now for 9 days. Chemotherapy kills cancer cells as well as fast growing cells. This means that chemo harms cells in the bone marrow, digestive tract, and hair follicles. It isn’t a coincidence that the day after Ashtyn visited her siblings she started feeling the effects of chemo. Chandler, Morgan, and Ethan needed the image of Ashtyn being healthy and comfortable so they could envision that through the difficult times. Today Ashtyn began showing signs of the effects the chemo is having on her body. Her ANC is 0. She has no ability to fight infection. Throughout the day I worried that she might be coming down with an infection. Her temperature was slowly rising and it just didn’t feel right. By 8 pm she was 100.5. The doctors treat for infection when her temperature reaches 101. 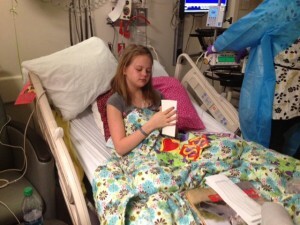 She also had a nosebleed today due to her low platelets and had a platelet transfusion. Her mouth has become extremely sore over the last 16 hours with the start of mucositis which is also affecting the lining of her throat. It is difficult for her to swallow and is painful to eat. She drank a Slurpee and threw the entire thing back up. With all the things she is dealing with, she stayed strong today and tried so hard to stay positive. In the evening, though she wasn’t feeling very well, she addressed all her valentines for her 6th grade class. Ashtyn decorated her own Valentines Day box for school earlier this week. She worried that her classmates would forget to give her Valentines cards since she won’t be there. Ashtyn asked me to email her teacher and make sure they don’t forget her. Though I knew she wouldn’t be forgotten, I sent her teacher an email anyway. Ashtyn is currently on quite a few medications. She takes medicine at least every 2 hours throughout the day and night. She is coming to the end of taking her three different chemotherapy drugs (doxorubicin, cytarabine, and etoposide). Other drugs include “Voriconazole” a prophylactic antifungal medication, “Septra” a prophylactic antibiotic, Colace to keep her bowels moving, mouthwash to help with mucositis in the mouth, eye drops to prevent infection in the eyes. Zofran, Benadryl, Phenergan, and Ativan for nausea. Oxycodone and morphine for mouth and throat pain. I am so grateful for all the medications that play a part in helping her get better. At 8 pm Ashtyn’s Bishop and Stake President came to visit. Before leaving they asked Ashtyn if she wanted a priesthood blessing. She accepted. They put their hands on her head and the Stake President gave her a blessing. The blessing started out sounding generic to what she was in need of. He blessed her that the doctors would be inspired to treat her properly and that she would have peace. Soon though the blessing didn’t seem generic to me anymore. His voice changed and with power he said, “I command these infections and illnesses to leave your body.” He proceeded to bless her with the ability to tolerate everything in her future. She will feel pain and discomfort, but blessed her that she will never have more than she can bear. Afterwards I asked him what he thought when he commanded her illness to leave. He didn’t remember what he had said so didn’t know what it meant. But I knew exactly what he meant. Of course she still has cancer. That wasn’t what he commanded to leave. I believe she did have an infection of some sort, and whatever infection she had was healed using the power of God. By midnight her temperature had stopped climbing and instead had come down from 100.5 to 99.5. I believe everyone has a part to play in helping Ashtyn, and each individual’s role, whatever that may be, cannot be filled by someone else. It truly is an orchestra with all “instruments” needed. As her church leaders left I asked them if they would please keep her in mind. If they ever feel to come and visit her, to do so right away. If ever an impression comes to mind concerning Ashtyn, to please act upon it. I am asking the same from Ashtyn’s Army. If you ever feel to say a prayer, or share her story, or write a note, or send an encouraging letter, email, thought, or quote, please do so. If you are inspired to write a song, or poem, or help my family and Ashtyn in any way, I ask you to not ignore your intuitions. Ashtyn woke up at 2:30 am in quite a bit of pain in her mouth and throat. The only thing she could manage to say was, “Mom, can you get on facebook and tell everyone to pray for my mouth so I can eat tomorrow?” She has faith in God and in her Army. So do I.